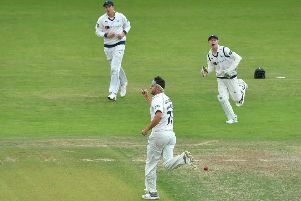 Yorkshire handed a first-team cap to new ball seamer Ben Coad prior to day one of their County Championship match with Hampshire at Emerald Headingley on Tuesday. Coad has taken 91 Championship wickets in the first 20 appearances of his fledgling career prior to this fixture. 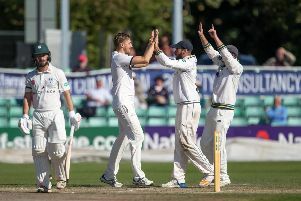 Harrogate-born Coad, having sporadically played first-team cricket since debuting in 2013, finished a breakthrough summer of 2017 with 50 wickets in the County Championship and scooped three end of season awards, including Members’ and Players’ Player of the Year. “It’s a massive honour to receive this,” said Coad, shortly after the presentation took place. “I wasn’t expecting it but apparently the family knew beforehand and didn’t tell me. I’m very honoured and privileged to have received it. “I’ve always wanted to be capped but I didn’t expect to ever achieve it until the last couple of years. To get it now is massively pleasing. “It’s a dream come true, I’ve always wanted to try and get to this stage of my life and the names you see on that board, just to join them is incredible and nobody can ever take it off me. It’s a dream come true, I’ve always wanted to try and get to this stage of my life and the names you see on that board, just to join them is incredible and nobody can ever take it off me.